My oldest daughter Emily and I share a love of the water. 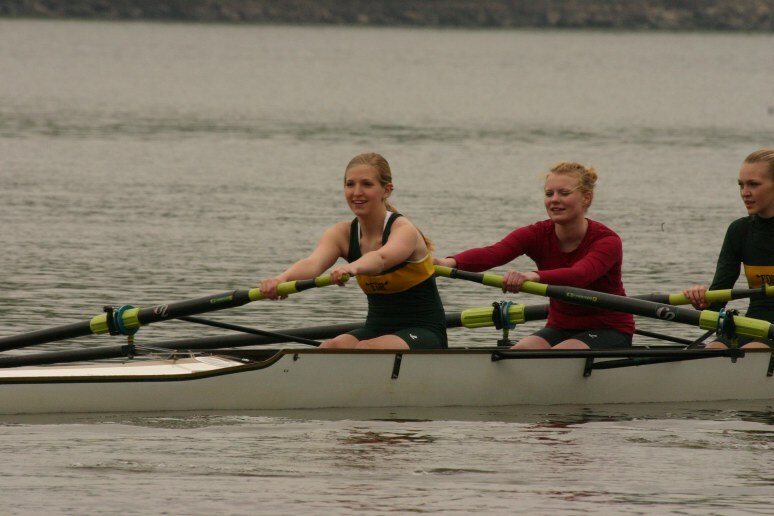 I have owned a boat most of my adult life, and Emily has been rowing in a crew shell on the Hudson river since she was 12. This year Emily was disappointed that the Varsity coach for the last 10 seasons, decides to retire. She is very trepidacious about the replacement coach, but with Lori and my urging, she gives him a chance. At the winter erg competition held at Marist College, Emily races 15 other rowers on stationary rowing machine. She takes a quick lead and stays steady. Three quarters through the race she starts to fade and the other rowers catch up. With her teammates and I cheering her on, she finds the extra push and wins the competition! I am so very proud to hug and congratulate her! The weather gets warmer and practices on the water begin. After another disappointing practice with the 8 woman boat, the coach asked Emily how much she weighs. Since she is under 130, she is eligible to row in a lightweight boat. The coach finds three other lightweight rowers, who are all Sophomores, and the start to practice rowing in a lightweight 4 woman crew shell. During practices these four consistently row faster then the schools senior four boat, with girls much bigger and powerful then them. Crew teams practice on the Hudson River. The river is usually the calmest at Sunrise and Sunset. 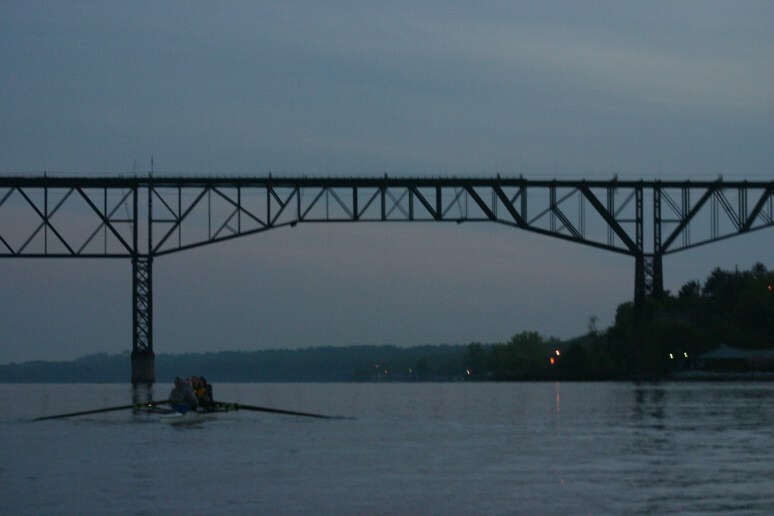 Here Emily and her fellow rowers practice before dawn in May. Emily has a license plate frame for her car that I bought for her. It says "Crew" at the top and "where were you at 5:30am?" at the bottom. At the first race of the season against 4 other schools lightweight boats, Emily's boat wins and wins big! They have such a huge lead, they are coasting to the finish line. They are able to beat all of the local competition, and when one of Poughkeepsie's lightweight four rowers cannot make the weigh in, they win the triangulars! This qualifies them for a chance to row in Saratoga in the New York State Championships! Here is Emily's boat racing to the finish on the hudson in Triangulasr for another 1st place finish! Lori, Rachel and I pack the car for an overnight stay in Saratoga and head north to cheer Emily on in her qualifying heat on Saturday. We are waiting at the finish line when the race starts 1500 meters away. We can't see the boats at first, but we hear the announcer calling the race. "FDR takes the quick lead, with St. Anthony's in second...as they reach the halfway mark, FDR is still leading the race with a strong 32 stroke pace." Now we can see the boats with the binoculars. We all start chanting "F-D-R...F-D-R....", although the other boats started closing in, Emily's boat pulls ahead with strong strokes at the end and they WIN their heat! 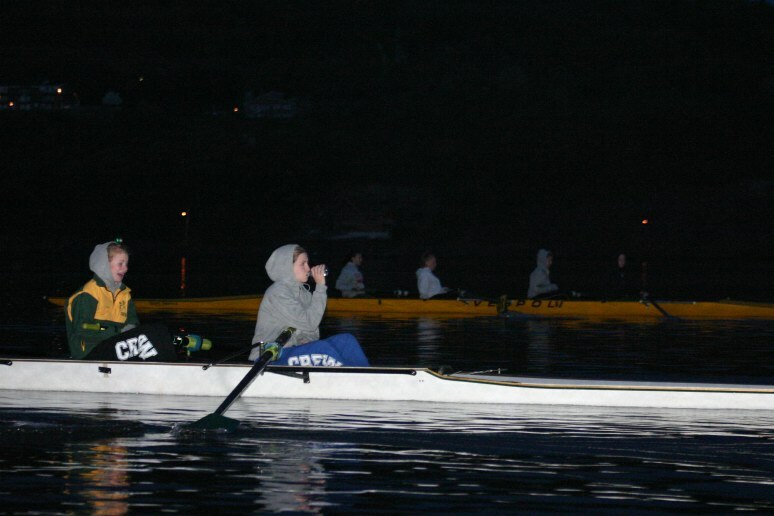 After they cross the finish line, all four rowers, and their coxswain are overcome with emotions and all are crying with elation over their achievement. They have just won their heat and automatically qualify for the race for the New York State Championship! They are by far the youngest girls in a lightweight 4 boat, as the other rowers are all Seniors and they are all Sophomores with Emily being the only Junior. Here is our Emily with all smiles after winning the Triangulars, a local race on the Hudson. The next day, they race in the NYS championships. It was a humid day and their race was at 3:30pm. They discover a mechanical flaw with the steering on their boat moments before the race and scramble to repair it. The repair does not hold and their boat veers from side to side up the lane as they race to the finish. In the end, they finish third in the race. Unfortunately only the first two move on to race in the Nationals held in Tennessee. 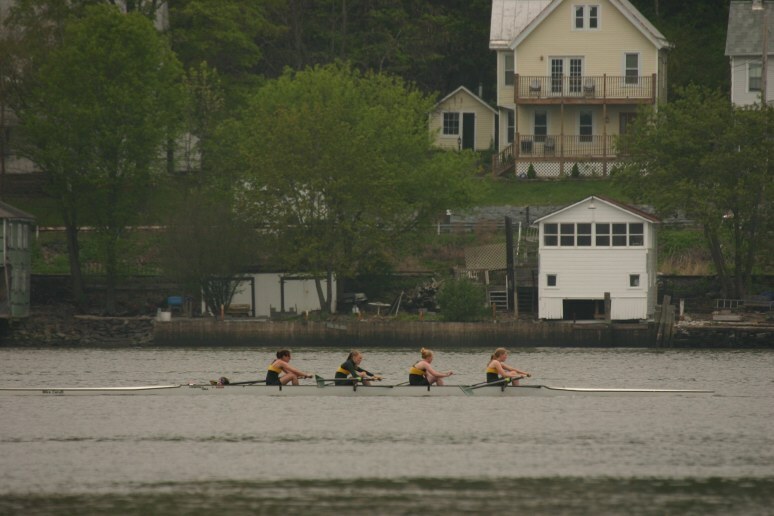 Disappointed, the girls learn that they have earned a bronze medal for finishing third in New York State in the Lightweight 4 division. Their coach explains that although finishing first or second guarantees you a trip to the nationals, they leave about a dozen slots open for teams that petition that their overall season race times should earn them an invitation to the nationals. 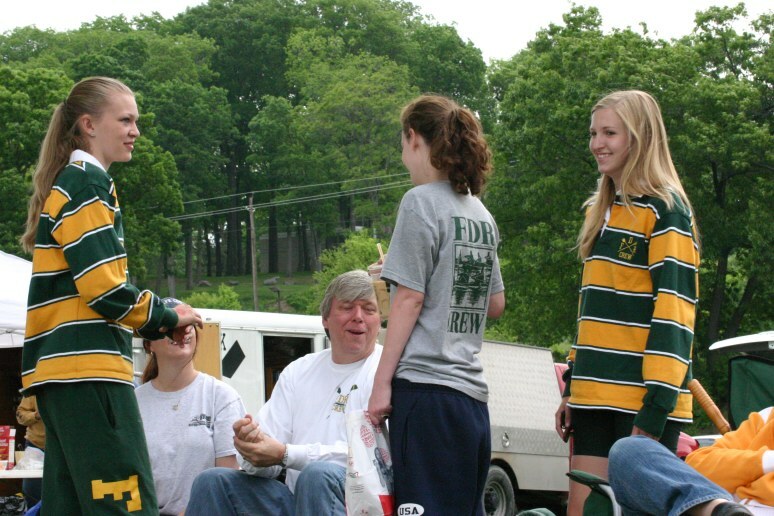 The race organizers for the national school race agree with Emily's coach and they earn the right to row in Tennesee against the best scholastic rowers in the country! Lori, Bonnie, Sherry and Jean all drive down to Tennesee to watch Emily's boat compete in the National Scholastic rowing Championship. Emily and the FDR boat were not able to advance past the qualifying round at the Nationals, however to be recognized as one of the top rowers in the Nation is a very high accomplishment, and we will be forever proud of her spectacular year. Emily is a senior this year and plans to row one last time for FDR in the lightweight four crew shell, so the best may be yet to come! Here is Emily rowing in Tennesee at the Nationals in a picture taken by her Grandmother, Bonnie. 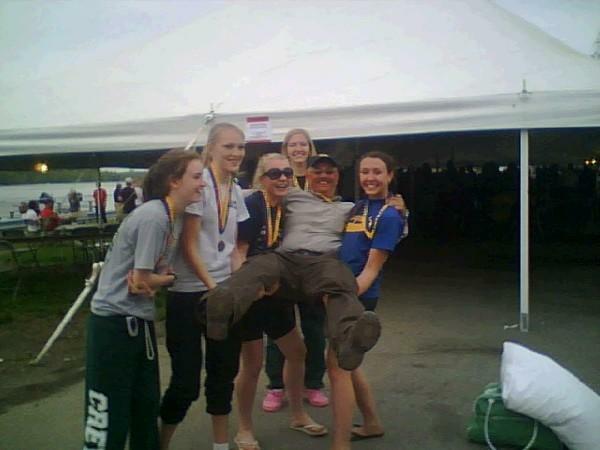 Although Emily rows in the "lightweight" boat, here they show there coach who the REAL lightweight is! 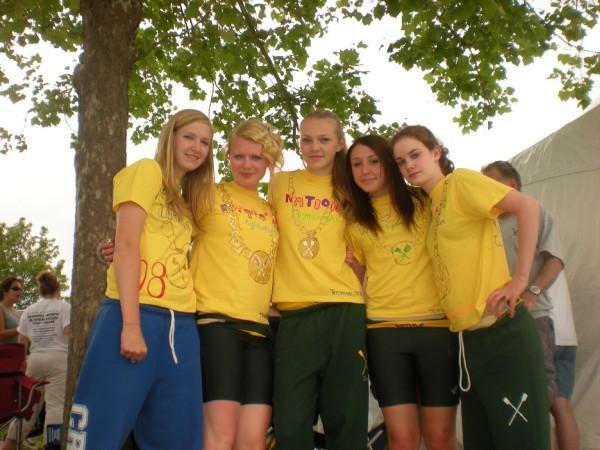 classic example of a complete team sport and Em is very close to her fellow rowers and coxswain.